Let’s recall that to be selected for this list of the greatest revenue stamps, a stamp needs to meet one or more of the following criteria: visually stunning; historically significant; interesting philatelic history; recognizable to those outside the hobby. After a brief hiatus in this series of articles, we return again to the federal revenue stamps. Instead of trying for diversity, we will explore in depth a brief period of time, the month of July, 1898, when the Congress, in response to the sinking of the USS Maine in Havana harbor, had created new taxes and had raised the rates of established taxes. The revenue act was signed into law on June 13, 1898 with an implementation date of July 1, less than three weeks later. The Bureau of Engraving and Printing was swamped with swamped with the work of overprinting beer stamps and the various tobacco taxpaid categories (cigarettes, cigars, the new smallcigars, snuff, and manufactured tobacco). As if that were not enough, there were the new categories of documentary, proprietary, and mixed fl our. For the documentary category, the Bureau overprinted large quantities of the then current 1 and 2 cent postage stamps with a bold “I.R.” (Scott R153 - 5) and the $5 newspaper and periodical stamp (also a postage stamp) with a more elaborate internal revenue text (Scott R159 - 160). The Bureau then proceeded to work on permanent replacements for these expediencies. Collectors have long been aware that even with these hastily overprinted provisionals, there were additional diffi culties with the distribution of stamps across the country. Local overprinting solutions in various offices of district collectors of Internal Revenue for the taxpaid categories were apparently authorized and tolerated. But there were no supplies of old documentary and proprietary stamps in the district offices for these were new categories of taxation that had disappeared in 1883, sixteen years before. The 2008 Scott Specialized Catalogue has finally recognized the privately printed labels used on the proprietary medicines of 11 companies, 10 in St. Louis and one in Macon, Georgia (Scott RS320 - 395). We shall not delve into these as they are comprehensively covered by a fine special feature article in the 2008 Scott U. S.
in the Scott U.S. Specialized. The location to be explored is the area served by the District Collector of Internal Revenue in Syracuse, N. Y. Two shipping firms doing business on the Erie Canal apparently got caught short when the District Collector could not supply one cent documentary stamps. 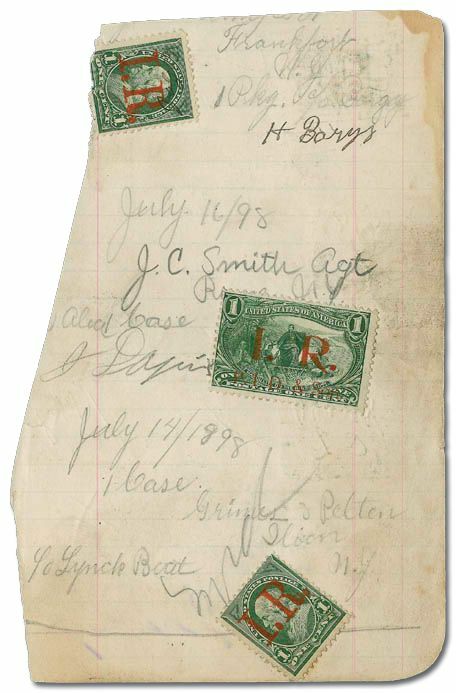 Each resorted to the same solution, possibly proposed by the Purvis Printing Company and endorsed by the District Collector, to overprint sheets of the current one cent Trans-Mississippi postage stamps with a large “I.R.” and the initials of the users. In each case five panes of 50 stamps were overprinted, a total of 250 stamps for each of the shipping firms. The first of these (Scott R158A) was done for Captain L. H. Chapman of the Chapman Steamboat Line, which had stops at Syracuse, Utica, Little Falls, and Fort Plain. Of the 250 stamps that were produced at least 18, including one on document are known in collections today. The sole surviving document with this provisional is dated July 8, 1898. It is a receipt that serves several functions for the shipment of five casks of ale from the Oneida Brewery in Utica to Little Falls, a distance of about 20 miles on the Erie Canal. The receipt acknowledges that the shipping firm has received the casks and further has delivered them to the Squire House in Little Falls. I think that it is reasonable to assume that this was returned to Oneida Brewery. I think that it is also reasonable to assume that a separate unstamped copy of a bill was left with the Squire House. The second shipping firm operating on the Erie Canal that used a similar provisional was P. I. Daprix & Son which ran between Utica and Rome. This provisional (Scott R158B, is the rarer, only four copies recorded in collections. Once again we are able to illustrate this stamp on the only recorded, existing document. The document appears to be a page from a receipt book. The provisional was used on July 16, although the presence of two copies of R154, the Bureau I. R. provisional both before and suggests that this provisional may have seen service for only a very brief period. Both of these documents at one time graced the collection of Henry Tolman II, arguably the greatest collection of U.S. revenues formed in the second half of the twentieth century. content. All three were favorite beverages in a town that had voted to not permit the sale of alcoholic beverages. But of course Swamp Root was not a beverage! The Kilmer firm was unable to obtain the required proprietary stamps from July 1 to 4 in spite of inquiries dating back to June 16 to Syracuse and to Washington. So on July 5, the Kilmer firm went out and purchased one, two, and three cent postage stamps at the Binghamton Post Office. Using the firms extensive print shop, they overprinted the postage stamps with a large “I. R.,” the firm’s name, and date. Like the steamboat firm’s provisionals, the Bureau provisionals were the inspiration for the large I. R. overprint. Kilmer resorted to this practice from July 5 through July 14. 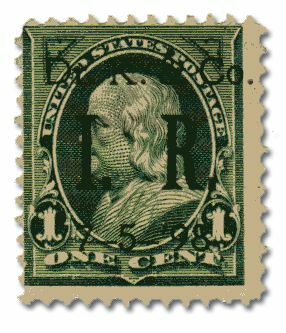 The one cent stamps (figure four) were in lieu of a 5/8¢ proprietary stamp; the two cent stamps were in lieu of a 1 1/4¢ stamp; and the three cent stamps were in lieu of a 2 1/2¢ stamp. In effect Kilmer was overpaying the tax due, albeit the funds went to the wrong agency of the government. The post office was the beneficiary, not Internal Revenue. One style of overprint was used on July 5. A second style was substituted on July 6. From July 7 through 14, the second style was continued and a third style also was used. Ironically, all went well until one of the shipments to Philadelphia were seized by Internal Revenue. 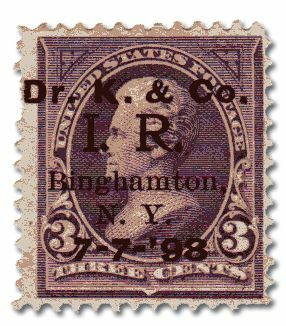 The specifics of the outcome with Internal Revenue remain unknown, although it is known that Kilmer later in July sent out battleship proprietary stamps to replace the overprinted postage stamps that remained in pharmacy stocks. 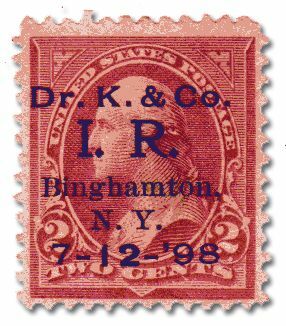 The philatelic irony is that the Dr. K provisionals which were not accepted by Internal Revenue have been listed in the Scott U.S. Specialized, whereas the St. Louis provisionals, which were authorized by Internal Revenue had to wait until the 2008 to get listed. Shortages took place in other locations. The Scott U.S. Specialized lists three denominations (Scott R156 - 158) that were used by the Michigan Mutual Life Insurance Company. These are well documented, but as far as I know all have long since been removed from the policies on which they were placed. The American Revenuer in 1982 contained an article describing some locally printed I.R. provisionals on postage stamps used at a bank in Ambler, Penna. and some other I.R. overprints on the blue one cent postage stamp. The Joyce collection also contained a number of manuscript provisionals, including some on the Trans-Mississippi stamps, but most removed from the originating documents. Without more definitive proof, these all must remain in philatelic limbo, unless someone can produce better supporting evidence that they are genuine provisionals. One must be cautious with these undocumented single pieces. They are very subject to forgery, especially when the pecuniary rewards are high.